Safe Activation is an online activation service that works with software protection and licensing tools including QuickLicense, DocProtect and AppProtect. LicenseSupport enables a customer support person to efficiently manage software licensing issues by phone, email or Internet. LicenseSupport allows a support person to work directly with a customer that is using a protected application. This task-oriented tool prompts the sales or support person for the required information and generates a license code to support a customer by phone or email. With modest technical skills, the support person can provide an activation code, reset a license, extend a time-limited Trial or block an activated license before issuing a refund. LicenseSupport also connects to the Safe Activation server to quickly change or view information related to a specific license activation. A support person can quickly see the number of allowed or active licenses for a Serial Number. The support person can remotely reset or suspend a license, increase the allowed activations, change the subscripton license status or enable optional paid features in a license. Customer data including custom fields can be edited, searched, imported, exported or added from a Safe Activation generated email message. By integrating customer data, integrated email support, license commands and historical logs, LicenseSupport can simplify the support process for a specific customer license based on the Serial Number. The LicenseSupport product documents a secure programming interface to the Safe Activation server. A vendor-written application or web service can securely access support commands to retrieve a Serial Number for a specific product, check the status of a license or view a customer record. Status flags, allowed activations or optional features in a customer license can be remotely enabled or disabled. Read and write activation or order data. 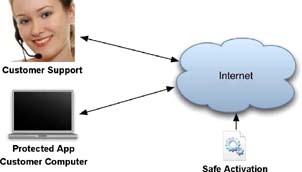 The Safe Activation programming interface is typically used from a shopping cart running on a vendor web site. When processing a customer order, Serial Numbers can be securely retrieved, the allowed computer activation count can be set to match the ordered licenses and selected features in the license can be enabled in the activation server during the purchase process. Customer accounts and support services running on a vendor web site can access or update real-time licensing data stored in the activation server or used by the protected application running on a customer computer. QuickLicense runtime now has a passthru command to securely send these same API commands from a protected application. LicenseSupport Windows runs on any Windows 7, 8, 8.1 and 10 computer with a 32-bit or 64-bit processor. LicenseSupport MacOSX runs on Mac OS X 10.10 or later. Single User and Site Licenses are available. Support application, plugin, game, spreadsheet, PDF, EPUB, Video or document licenses running on Mac, Windows or Linux from LicenseSupport running on Mac or Windows.